LONHRO (AUS) (Brown 1998-Stud 2004). 26 wins-2 at 2, VRC Australian Cup, Gr.1. Champion Aust. Sire 2010-11. Sire of 1184 rnrs, 861 wnrs, 82 SW, inc. Pierro (ATC Golden Slipper S., Gr.1), The Conglomerate, Bounding, Mental, Impending, Denman, Beaded, Exosphere, Kementari, Lyre, Aristia, Benfica, Pinwheel, Heatherly, Wawail, Academus, Messene, Cardsharp, Encryption, War Heroine, Holding Gold, Isotherm, Souchez, Ghisoni, Lonhspresso, Obsequious, etc. REBEL CALL - GHOST (Sing.) (g. by Exceed and Excel). 4 wins-1 at 2-at 1000m, 1100m, A$108,200, S$247,994, WATC Perth S., L, Singapore TC Open H., West Coast Park S., Benchmark 67 H., 2d WATC Westspeed 3YO H., Singapore TC Forest Gold S., Japan Racing Association Trophy, Class 3 H.-twice, Class 4 H., 3d WATC Karrakatta P., Gr.2, Singapore TC Revolte S., Open H., Benchmark 89 H., Joao Moreira S., Class 4 H.
Nielson (g. by Lonhro). 6 wins. See below. Noble de Love (g. by Commands). 3 wins at 1200m, 1400m, HK$3,001,200, to 2018-19, HKJC Pok Oi Cup H., Peony H., Port Shelter H., 2d HKJC Jim and Tonic H., Wong Leng H., Boat Quay H., A Lange & Sohne Excellent H., 3d HKJC Tung Wah Group of Hospital H., Nanjing H., Daisy H.
La Tigeresa. 3 wins to 1400m, A$82,985, to 2018-19, MRC Highways Lunar New Year H., Mypunter.com H., 4th VRC Frances Tressady S., Gr.3. I Am the Fox. 5 wins from 1100m to 1600m, A$109,835, to 2018-19 in Aust. Teraset (g. by Reset). 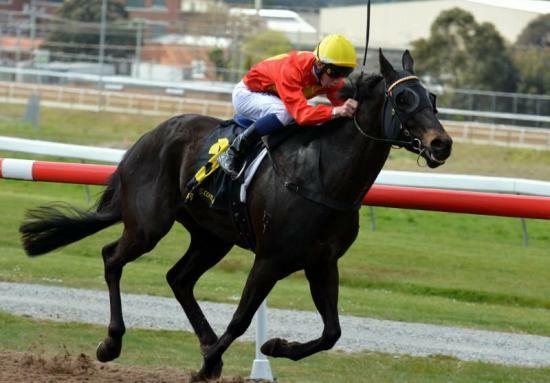 7 wins from 1400m to 1700m, A$92,675, 2d BRC David Jones H.
Laserjack (g. by Commands). 3 wins to 1350m, 3d BRC Channel Seven H.
Waialae (g. by Sepoy). Winner at 1400m in 2018, 3d Singapore TC Gingerbread Man S., Infantry S., Class 4 H.
Too Funny (f. by Exceed and Excel). 3 wins at 1300m, 1400m in Aust. Undercarriage (g. by Foxwedge). Winner at 900m in 2017-18 in Aust. Capannello (Onemorenomore). 4 wins to 1100m, A$175,600, to 2018-19, VRC Piping Lane H., 2d MRC Blue Diamond Preview (c&g), L, 3d SAJC Teys Australia H., Thirsty Camel Cup H.
Hellaroo. 5 wins to 1200m, A$104,340, Ipswich TC Sirromet Collection H., 2d BRC Allan Reardon H., Ipswich TC XXXX Summer H., 3d Ipswich TC City of Ipswich H.
Bel Sonic. 4 wins to 1200m, A$367,400, to 2018-19, Ballarat TC Magic Millions Classic, MVRC Ladbrokes VOBIS Gold Carat, Pakenham RC O'Connor Beef H., 2d MRC Sheen Panel Service H., MVRC Bernadette Turner H., ATC Australian Turf Club H., 4th VRC AR Creswick Series Final S., L.
Lead Husson. 5 wins-2 at 2-to 1400m, A$84,335 in Aust. Terrenora (Encosta de Lago). 3 wins. See above. Racing Thunder. 3 wins from 1150m to 2150m, MVRC Jayco H., 2d MVRC Pages Event Equipment H., Members Equity Bank H., 3d MRC ET Barnard H.
Tattenora. 8 wins. See above. Persian Monarch. 5 wins from 1200m to 1600m in Aust. DANCER'S WAVE (Go Dancer). 2 wins at 1400m, 1800m, SAJC Hill-Smith S., L, 2d SAJC Scott Hodges H., Butter Menthol H.
Race Record: 35 Starts 6-8-4 A$91,635. 6 wins to 1200m, A$91,635, to 2017-18, TTC Great Northern Beer H., Blair & Sons Sawmill H., Devonport RC A&T Horse Transport H., Luxbet.com H., 2d TRC Trchobart.com.au H., TTC Seniors Festival H., Field Family H., Devonport RC Stridemaster at Tasracing H., Le Bel Opera H., 3d TTC Simon Kok H.